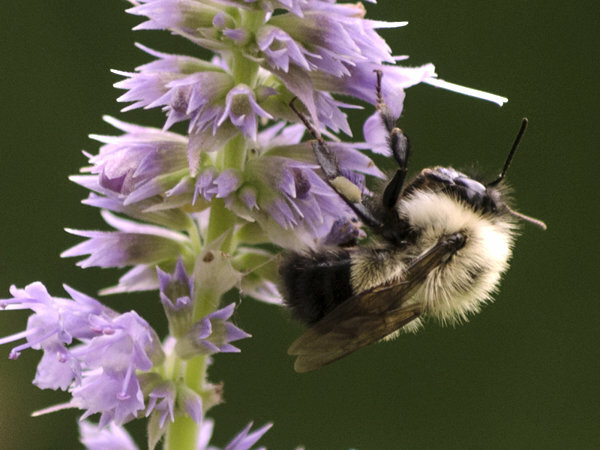 Carpenter bees (sometimes called "wood bees" or "borer bees") resemble bumble bees. But the upper surface of a carpenter bee's abdomen is shiny black, whereas the bumble bee's is hairy with yellow markings. Carpenter bees are primarily beneficial. Like all bees, they are efficient pollinators. In fact, in some places they are the primary pollinators of some crops, especially since honey bee populations have been stressed in recent years. They are also rather agreeable, as bees go. The males will fly around dive-bombing anyone or anything in sight, but it's just macho. Male carpenter bees don't even have stingers. The females do have stingers, but they almost never sting. Carpenter bees also do their part in combating childhood obesity because children seem to love chasing them around (or conversely, fear the bees enough to be chased around by them). In fact, one would think their passive habits, industrious pollinating, and general good humor would endear humans to carpenter bees. So why do these beneficial, essentially harmless bees qualify as pests? Carpenter bees drill holes in wood. They drill perfectly round holes of about a half inch in diameter that look like they were drilled by a skilled carpenter (which, of course, is true in a sense). In nature, carpenter bees drill holes in trees, especially dead ones. The problem is that they may no distinction between dead trees in the forest and dead trees that humans have used to build things like houses and decks. To a carpenter bee, one dead tree is as good as another; so they happily go about drilling holes in all sorts of things that we humans prefer not be drilled into. Even worse, as if to add insult to injury, carpenter bees seem to take special delight in drilling holes in impossible-to-reach areas. The more difficult a place is to get to, the more carpenter ants seem to enjoy drilling holes there. Way up in the air in the wooden trim along the edges of roofs is one popular place. In wooden clapboard siding is another, especially on the upper levels of a home. Carpenter bees also leave unsightly, waxy, difficult to remove stains known as ejecta that drip from the holes. These stains repel most paints and must be thoroughly removed and primed before the infested areas are repainted after treatment. Where Do Carpenter Bees Drill Holes? Carpenter bees drill holes in soffits, gazebos, and fascia board. Carpenter bees drill holes in door and window frames. Carpenter bees drill holes in bird houses. Carpenter bees drill holes in redwood decks. They drill holes in mailbox posts and wooden fences. They drill holes in patio furniture. They drill holes in playhouses. They drill holes in wooden swing sets. They drill holes in stored wooden boats. In fact, it's hard to think of any piece of coniferous wood into which carpenter bees won't at least think about drilling holes. Why Do Carpenter Bees Drill Holes? In all fairness to carpenter bees, they don't really go around drilling holes just to annoy humans, as much as it may seem that way. They actually have a much more practical reason. Female carpenter bees drill holes in which to lay their eggs. They lay multiple eggs in each gallery, separating them from each other with a bit of sawdust and wax. The eggs are packed into the galleries a bit like tennis balls are packed into a can: Single-file along the length of the tunnels. They usually enter the wood perpendicular to the grain (often on its narrowest surface), and then turn ninety degrees and drill their tunnels along the same direction as the grain. Through some trick we humans don't quite understand, carpenter bee eggs hatch and develop in the opposite order from which they were laid. In other words, the egg most recently laid will develop emerge first. That means they don't have to crawl past each other to get out of the hole. Like everything bees do, hatching and emerging from the hole is an orderly, well-organized process. 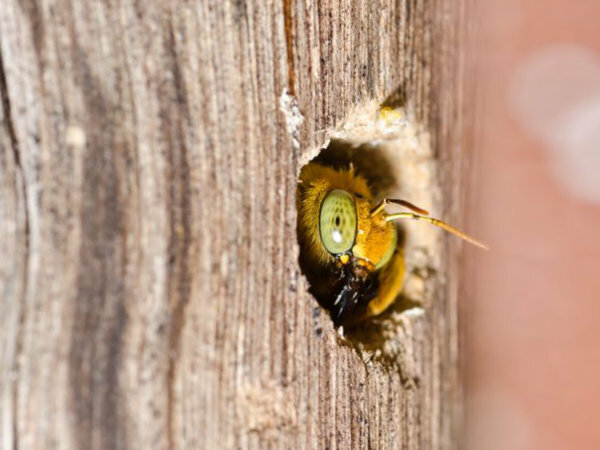 Because the galleries inside the wood can extend as much as several feet along the grain past the visible hole on the outside of the wood, carpenter bees can cause serious damage to homes and other structures. Over time, the cost to repair this damage can amount to thousands of dollars, primarily because of the difficulty of gaining access to the high places and other protected areas in which carpenter ants drill their holes.